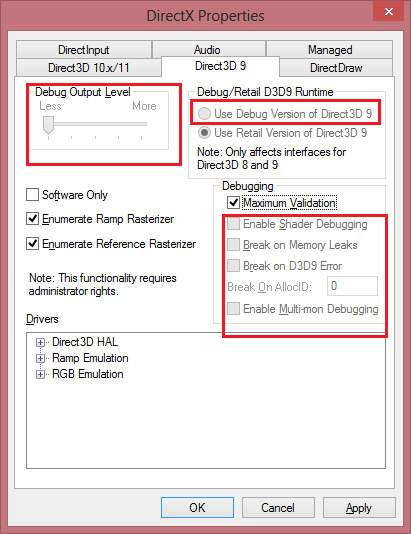 The Direct3D 9 Developer Runtime (aka D3D9D.DLL) in the legacy DirectX SDK (June 2010) is not compatible with Windows 8. In fact, the entire Developer Runtime in the legacy DirectX SDK (June 2010) is not compatible with Windows 8 or with Windows 7 SP1 with KB 2370838 installed. The only way to obtain the Direct3D 9 Developer Runtime for Windows 8 is to install a ‘checked’ version of Windows 8. The Direct3D 10.x/11.x Developer Runtime for Windows 8 is installed by the Windows 8.0 SDK, VS 2012, or the VS 2012 Remote Debugging Tools packages.